The more car and automotive parts consumption increases, the more business strategies the sellers take to adapt to this marketplace. And an E-commerce template is no exception. However, among thousands of Shopify template outsides, the problem they are most concerned about is how to build a good one with outstanding features to promote the business and increase profitability. In that case, CARIL - a Sectioned Shopify theme for automotive, cars and auto parts store would totally satisfy you as being tested carefully and QC passed by the official engineers. Your dream of increasing the number of loyal customers and thrive your car dealership from everywhere would come true with this is great Shopify that helps to scale your offline business by providing a perfect car & auto parts online shop. Look around CARIL, you could easily find out that the mainstream style is designed to be minimalist and powerful. Understanding that men would be the most loyal and potential customers of car parts and auto parts, you will not be able to find a better candidate than the black and white tone. Besides, to accommodate this class of customers, the layout of this Shopify theme is extremely neat and clear thanks to the complement of intelligent functions. No matter how complex and detailed that car parts are, your customers will never get tangled up in this CARIL sectioned Shopify thanks to Mega menu, which lets you show categories and pages menu in multiple columns with clear typography. In another hand, Vertical menu and sidebar can be enabled to show across the whole site making it become more convenient for shoppers during product selection process. Shopping is simply buying things you need. 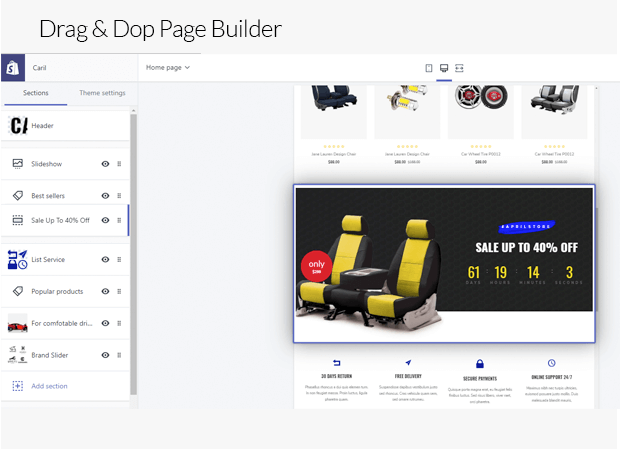 However, in this dreaming Shopify theme, your car parts images are organized by specific category, support sorting by newest, featured, most rated, and bestselling and showed as tabs, grid, carousel, or column listing. This amazing idea would help you have strong power to transform this seemingly tedious activity into a process of enjoying real pleasure. Not only that, popular categories and brands carousel would show your top categories and product brands automatically or even any images you want to attract customers, there is nowhere providing such a useful feature like this in CARIL. One more thing of this sectioned Shopify theme that could contribute to your business development is promotion banners supporting to show up in - promotions and sale off items in a subtle and attractive way. This surely hits the customer psychology and gives them no reason for not pick up a great automotive part before going out. Moreover, you would be extremely surprise at the countdown banner put right on the homepage – one more proof that CARIL totally have capability of boosting your sell better than other available Shopify template. You have no idea about running an E-commerce template and feel like it is impossible for business expansion online? Come and make it possible right now with CARIL. Supporting full screen slideshow, multi – languages as well but no coding required, there is no doubt that Caril - Car & Auto Parts Automotive Sectioned Shopify Theme would become the best effective supporter for your business. What are the highlight features ? Responsive UI/UX Design Optimized: Optimized for mobile, tablet, small screen desktop and large screen 1920px. Built with the latest Shopify theme technology: Sectioned which support drag & drop page builder to help you customize homepage in various style you want. Allow to show/hide any sections on page, rearrange sections, configure display type and change content visually without coding required. Dropshipping 100% supported. Import thousands of products from AliExpress to start your drop shipping store effortless. Mega menu: lets you show categories and pages menu in multiple columns with clear typography. Vertical menu and sidebar can be enabled to show across the whole site. New products, feature products, bestselling products blocks. All these blocks can be configured to show up as tabs, grid, carousel, or column listing. You can also configure number of products, number of columns to display. Products organized by specific category, support sorting by newest, featured, most rated, and bestselling. Allow to display multiple blocks of products by category. Newsletter form lets your customize opt-in the newsletter subscription for your email marketing campaigns. Popular categories shows your top categories automatically. Brands carousel lets you show your product brands automatically or manually. Furthermore, you can use this carousel to display any images as you want. Header supports 3 common styles: Logo on the left, Logo on the right and Logo at center. Footer supports to show your store info, address, links and your own custom links.